DHS is one of the largest central heating installation businesses operating in the South West. Based in Bristol, we have been established for over 40 years. Our business has been built around an enviable reputation for quality, service and excellent value for money. 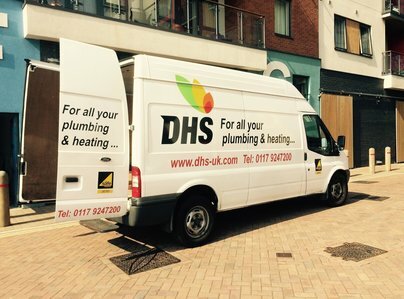 We sell, install, maintain and service all types of gas, oil and solid fuel systems in both domestic and commercial premises, including boilers, radiators and underfloor heating. We offer a comprehensive bathroom design and installation service as well as fitting wet rooms and showers. We also specialise in installing fires, including flueless gas fires and wood burners, and solar water heating. Our plumbers are skilled, friendly and trustworthy. They carry photo ID, wear uniforms and drive recognisable vehicles branded with the DHS logo. They have all the appropriate qualifications and training and are covered by public liability insurance. All of our apprentices attend college and work under the guidance of our trained engineers. This was an annual boiler service and it was performed with a smile and a chat and in a professional manner. No complaints at all. Many thanks for your feedback, DHS are always glad to be of service. Arrived on time for boiler servicing. Prompt and friendly - didn't make a mess! Will be using them again and would recommend DHS Ltd to others. Many thanks for your feedback, always nice to here positive feedback, always happy to help. Polite, friendly and efficient. Job done well and quickly. Highly recommend for your annual boiler service. Thanks for you great feedback, super happy to hear from a satisfied customer. This company services our gas boiler annually, for a reasonable fixed price, at a date and time to suit you. The staff are efficient and friendly and very recommendable. Thank you for your feedback and customer over the years Keith, always happy to see a happy longstanding customer. Annual boiler service (purchased the boiler from DHS). Entirely satisfied with efficient work and good customer care. Thank you for your positive feedback. Great working with you. The engineer was polite, helpful and well presented. Our last service by another trader was poor and expensive. Hi Frankie, thanks for your feedback, it's always great to hear positive things from customers. Boiler service. Good, professional job. Polite engineer was Nic. Thank you for your great feedback, DHS are always happy to be of service. Hi David, thank you for taking the time to give your positive feedback. DHS are always happy to help and super happy when we receive great feedback like this. Most helpful, a pleasure to deal with. Thank you, was also a pleasure working for you. I'm so impressed with Dynamic Heating Services. They replaced our boiler when it died over Christmas and New Year last year and they have just serviced it this year. The boiler replacement was straight-forward and DHS were really easy to deal with. The boiler service was the same - easy to arrange with a polite and knowledgeable engineer - also it was much more comprehensive than the ones I've had in the past from British Gas.